It’s no secret – living a healthy lifestyle is very important to me. I try to eat healthy every day and I LOVE to work out! Some days when I feel like I need a little boost of energy or want to add extra protein to my diet, I like to have a good, filling protein bar. I’ve tried many (many!) 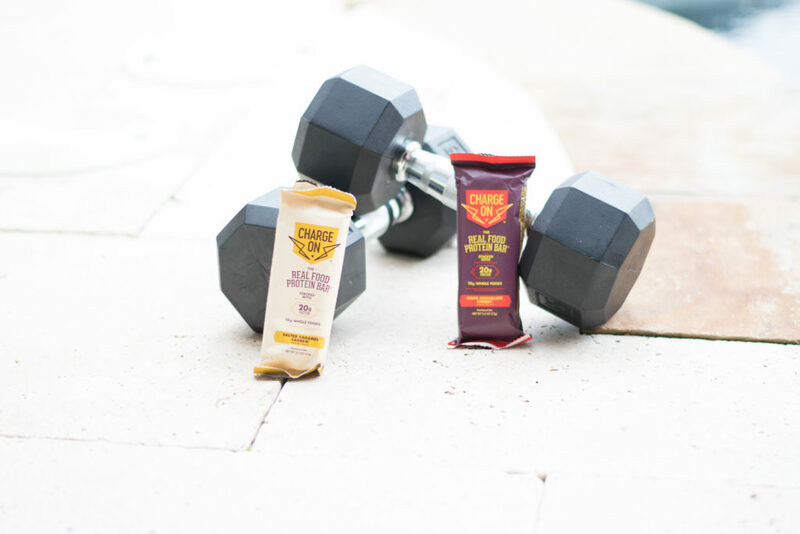 different protein bars over the years, and I love Complete Nutrition Charge On protein bars because they taste great but I really like this bar because it is very real – it has real ingredients and it isn’t over-the-top at all. The bars come in two flavors: dark chocolate cherry and salted caramel cashew. If you are a chocolate person, the dark chocolate cherry is for you. The chocolate is not bitter at all like some protein bars can be and the cherries are not overly powerful. And the salted caramel cashew is incredible, it tastes like you’re eating a candy bar! The bar is so sweet and caramelly that you would think it has a high sugar content but there is actually only 5g of sugar is both flavors. Although the bars are on the higher side when it comes to calories and fat, they are filled with the good kind of fat! Both flavors have almond butter and coconut oil. I love coconut oil (read more about coconut oil on my blog!) because it has so many health benefits and is great for any digestive help you might need. That is also what helps make them very filling so you’re satisfied and not wanting to reach for unhealthy snacks. Also, these bars are PACKED with protein. 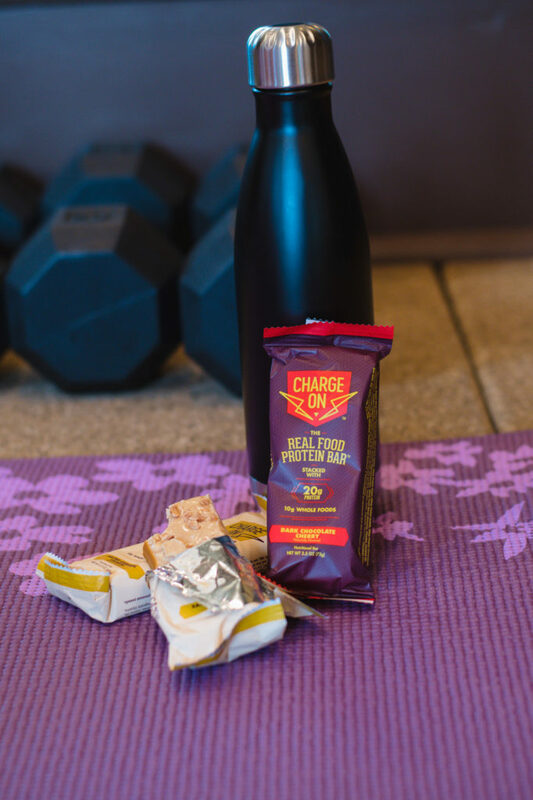 With 20g of protein in each bar, they really do give you a boost of energy. If you are looking to add more fiber to your diet, these are also the way to go! I was surprised to see that the dark chocolate cherry bar has 19 grams of fiber and the salted caramel cashew has 16g, that’s a lot and so great for your digestive health! Oh, and the best part about these bars is the texture. You know how most protein bars can have that dry chalky texture that is not pleasant? Not these! These bars have a great smooth texture with a little bit of chewiness and they feel almost moist in your mouth. So, if you are looking for a new protein bar to add to your diet, I would say to definitely give these a try. And if you’ve been iffy about even trying a protein bar in the past, then these are great to start with! I promise you won’t be disappointed. Complete Nutrition was nice enough to give me plenty of the dark chocolate cherry and the salted caramel cashew Charge On bars to give away! Head over to my Facebook, Instagram and Twitter to find out how you can enter! And you can use promo code WELCOME11 to save 11% on your first purchase at CompleteNutrition.com! Let me know what you think once you’ve tried them! Thank you to Complete Nutrition for sponsoring this post. All opinions are my own.